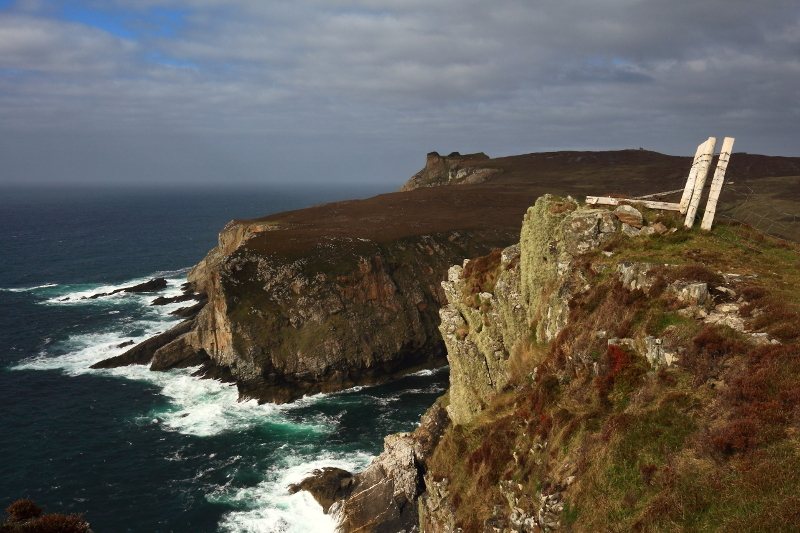 Late sunshine as I made my way back along Horn Head. 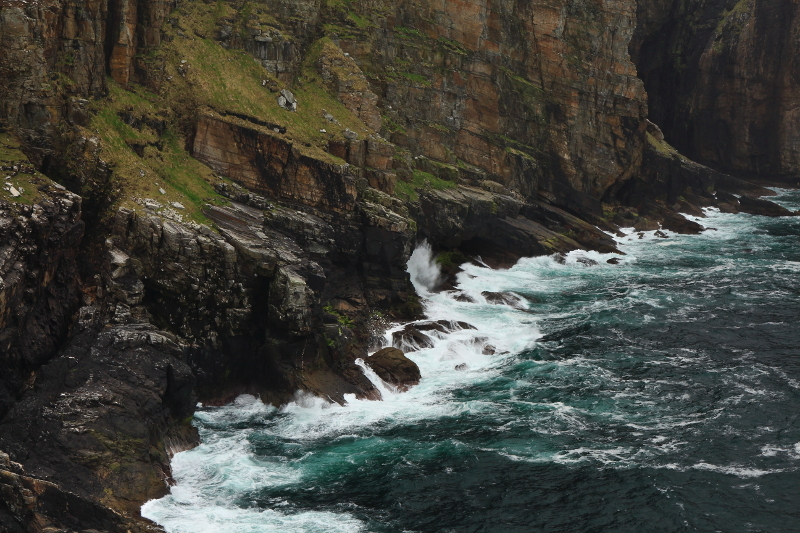 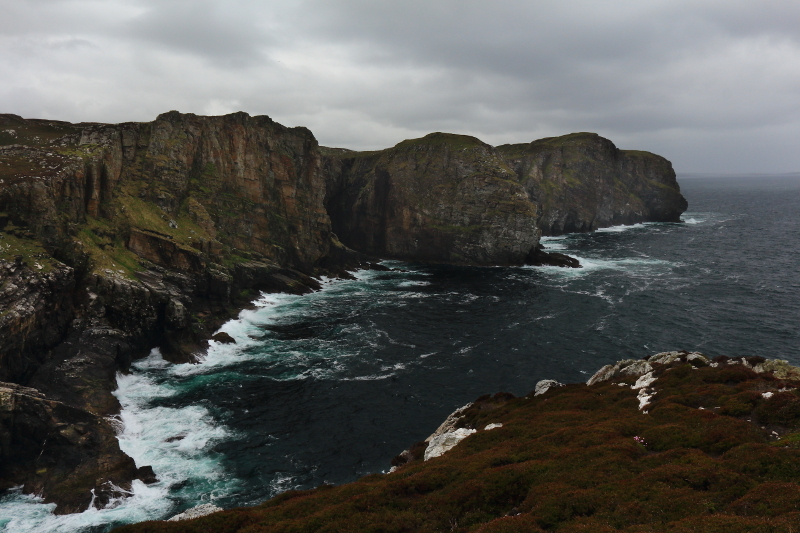 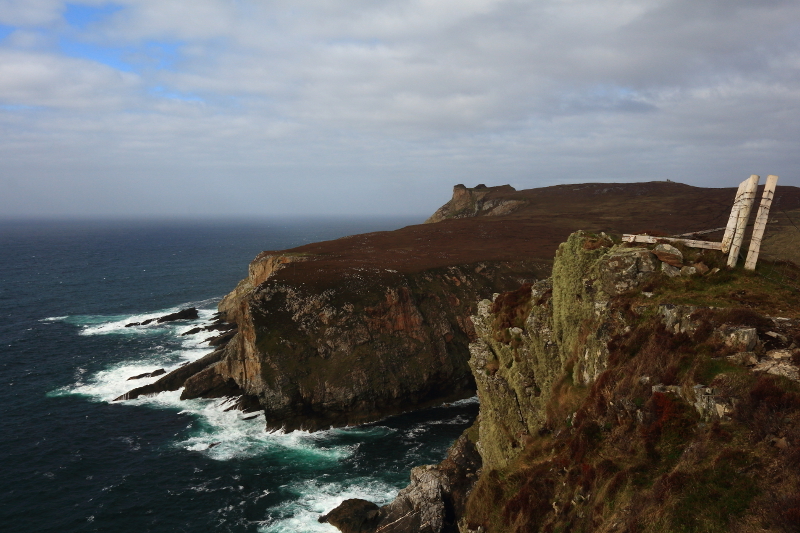 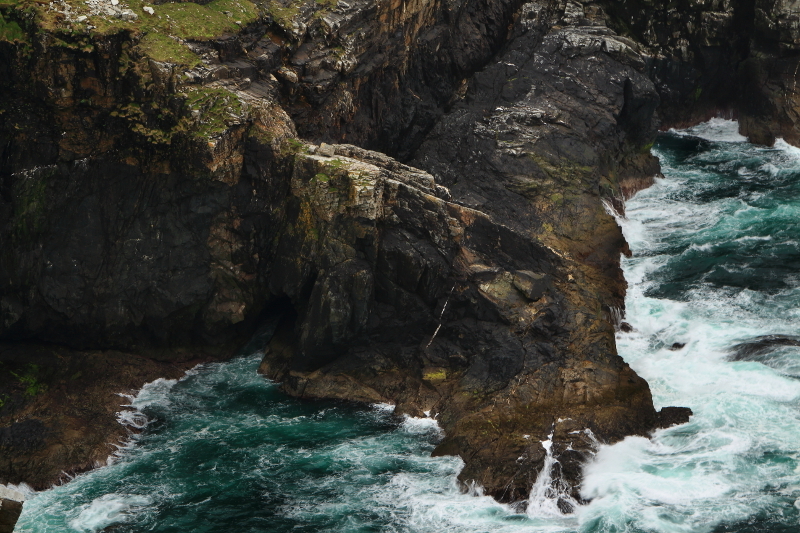 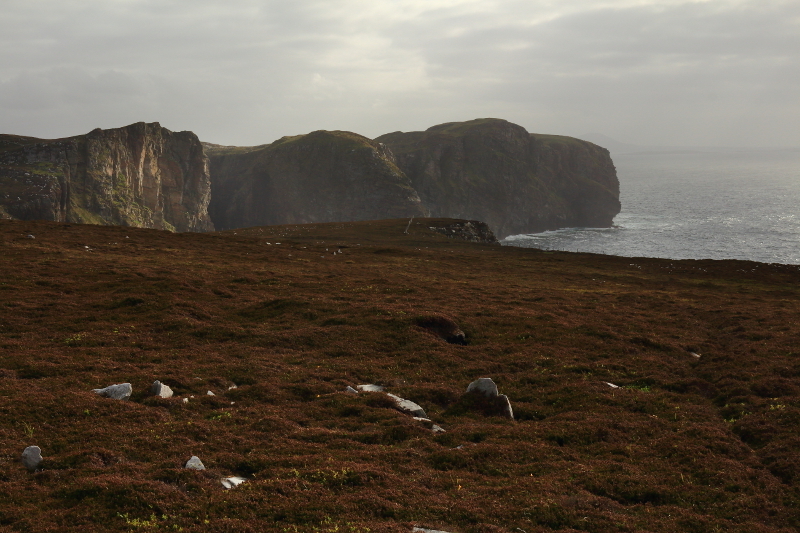 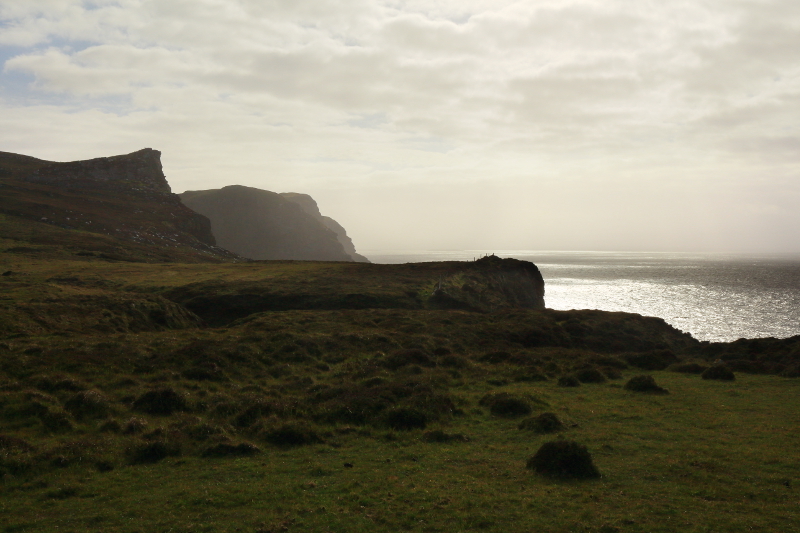 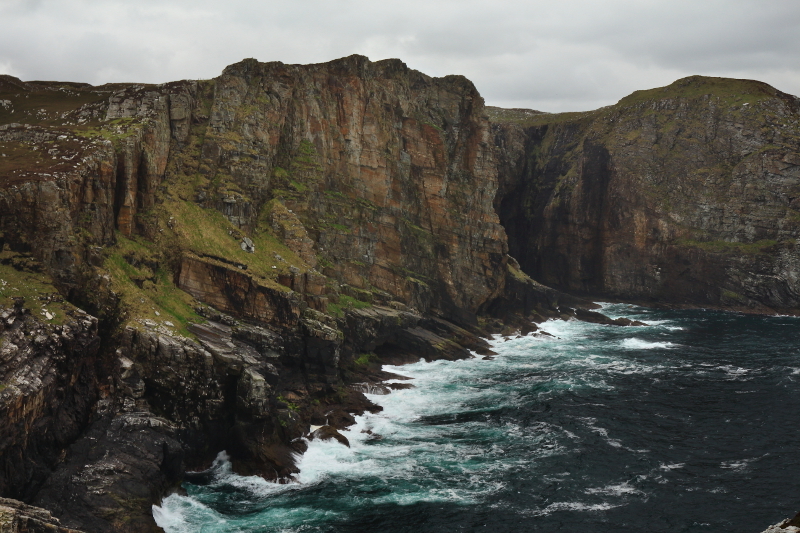 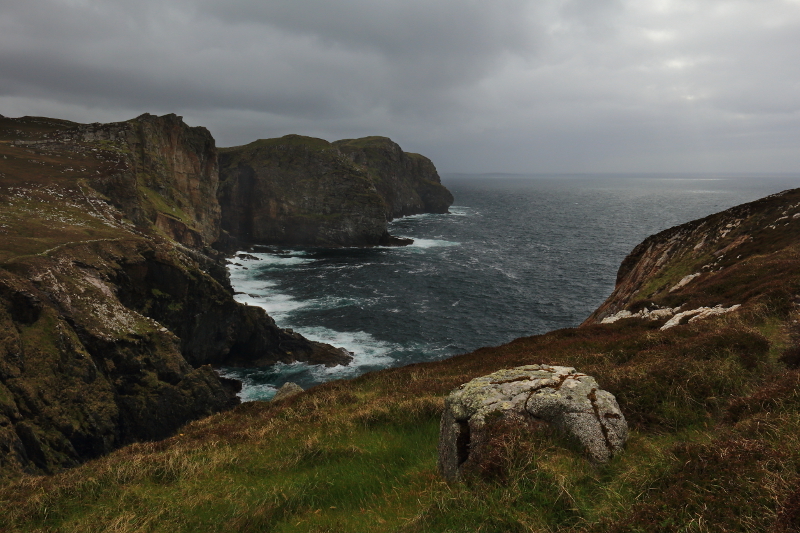 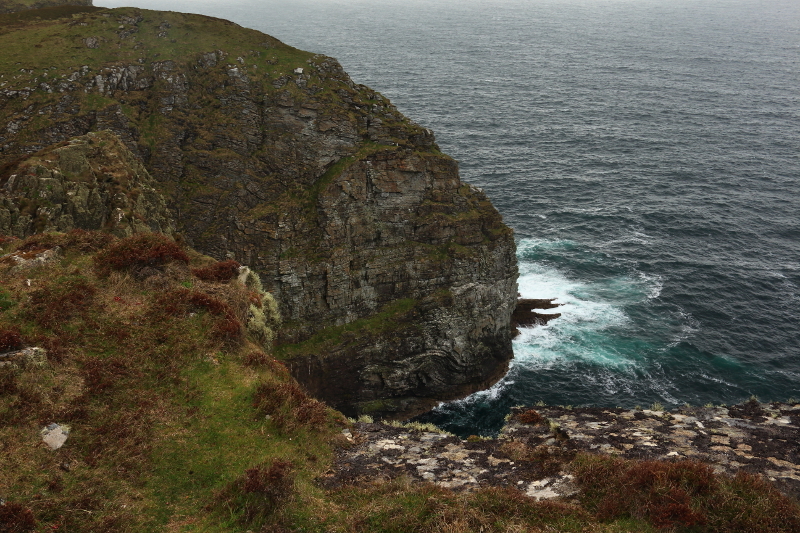 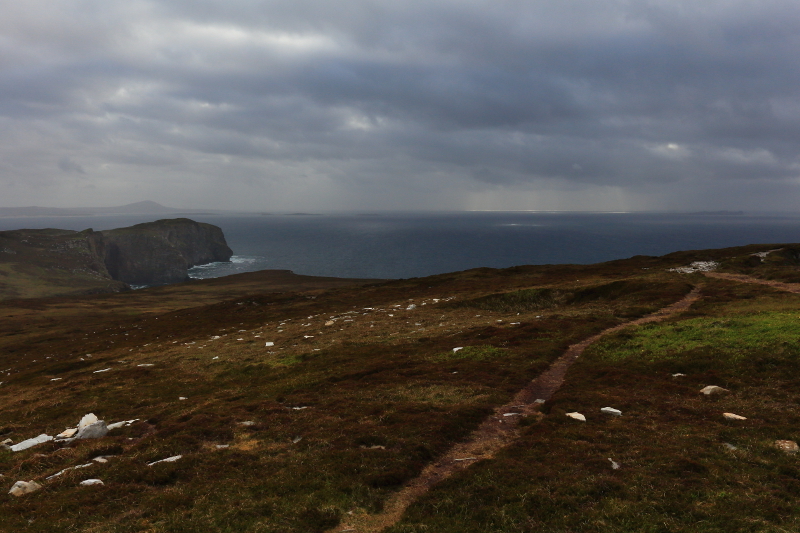 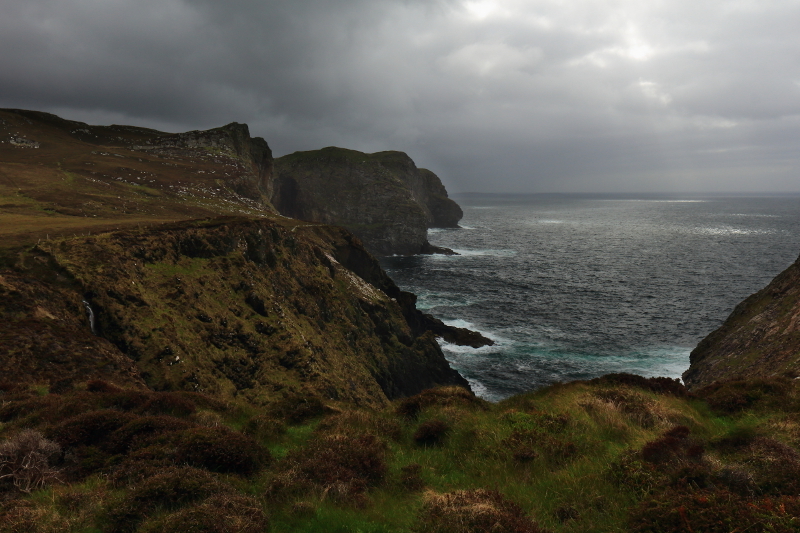 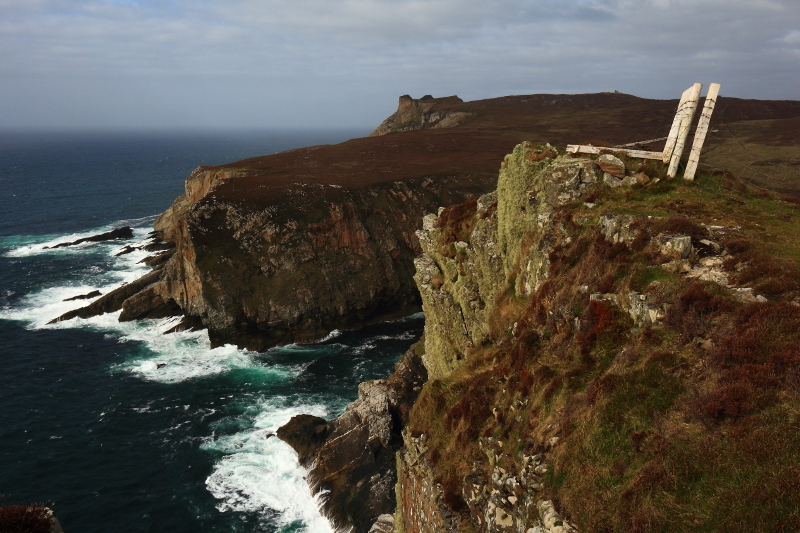 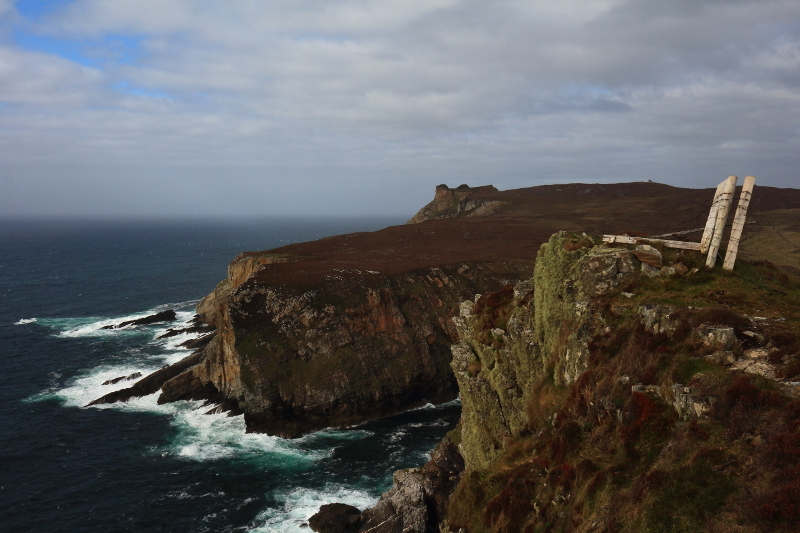 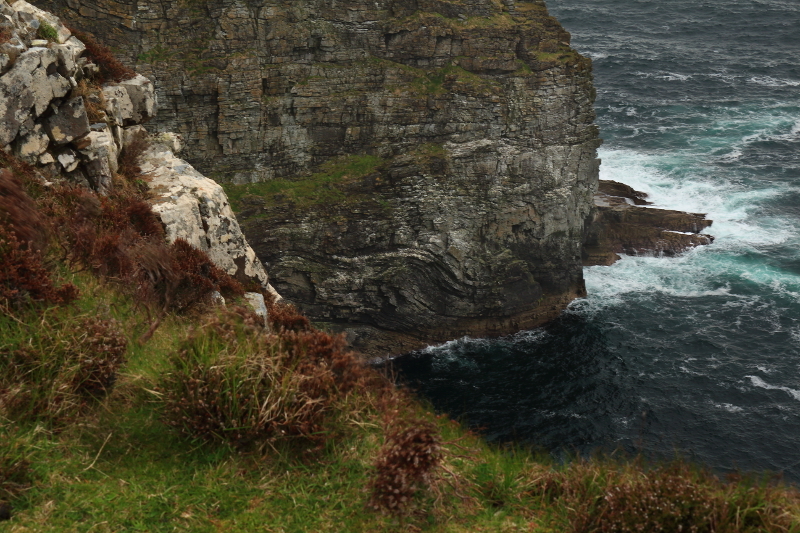 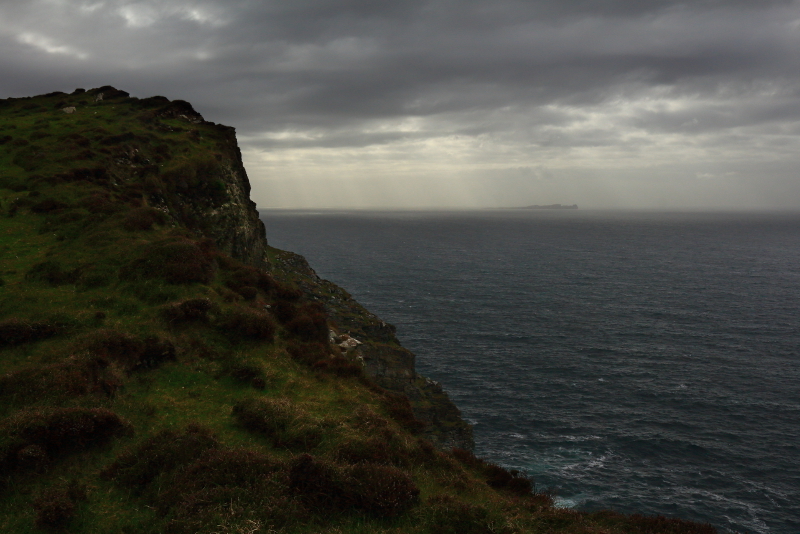 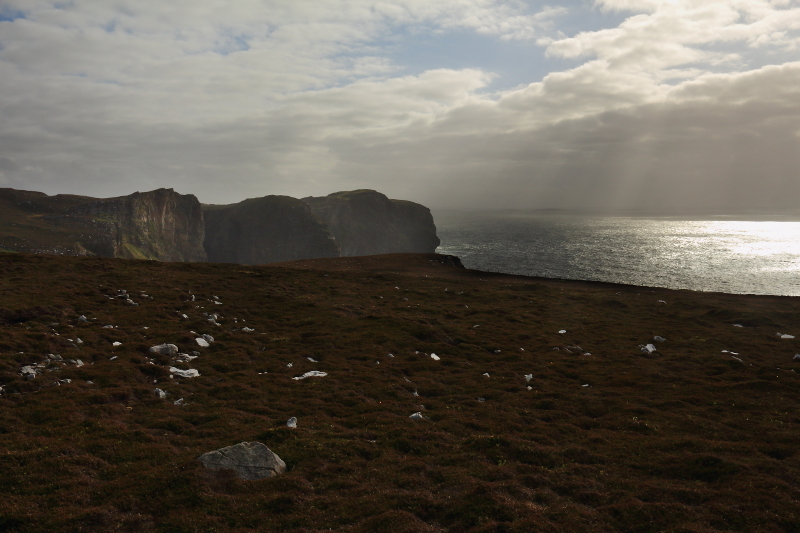 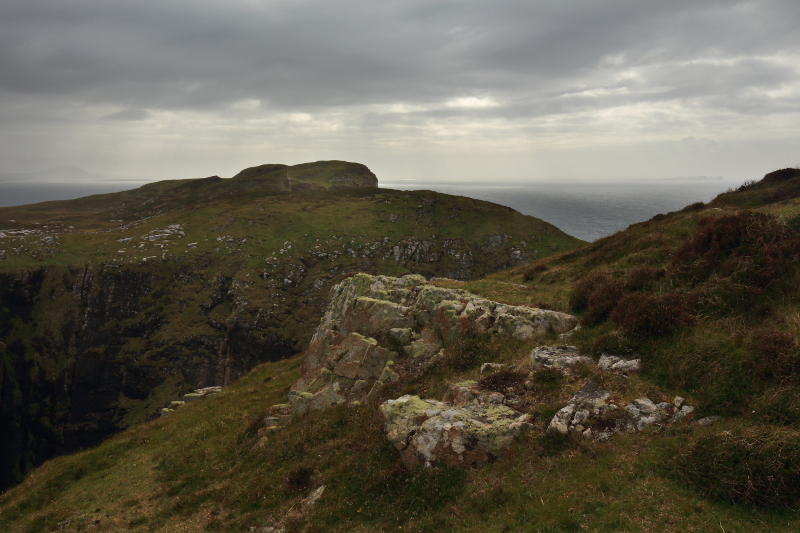 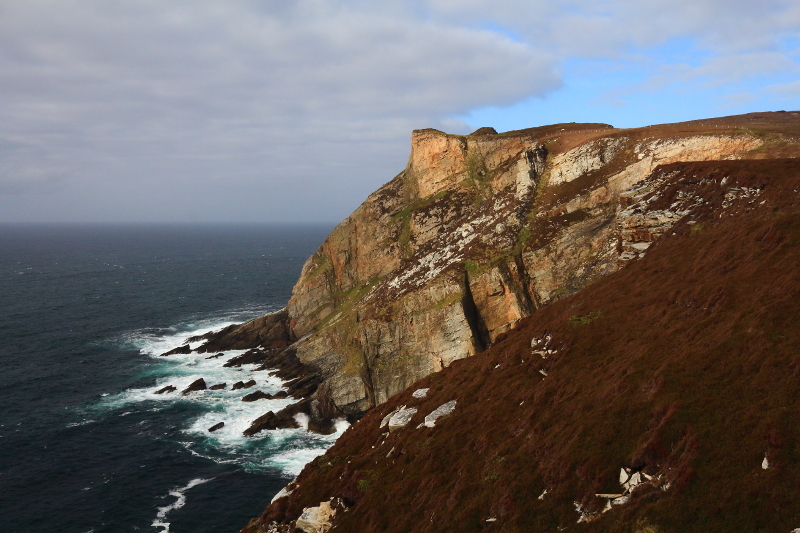 In Part 1 I had been making my way west along the northern cliffs of Horn Head. 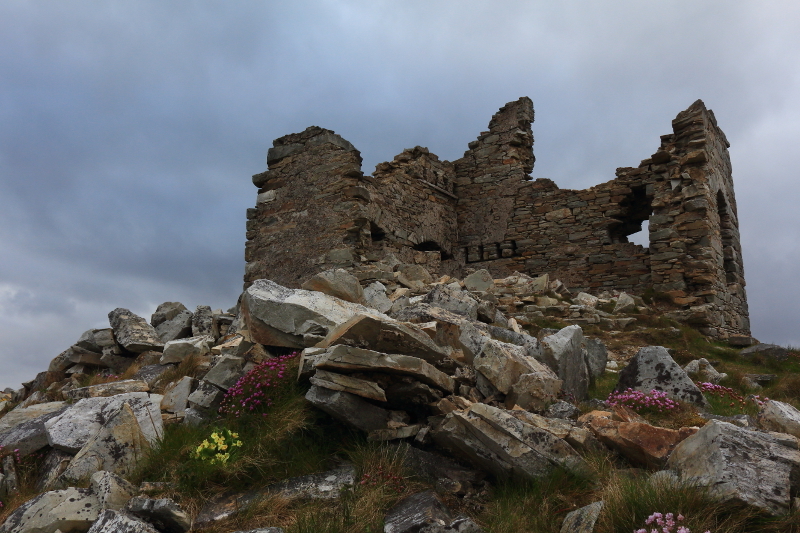 A late start meant I wasn’t going to make it as far as Tramore beach, which would have to wait for another day, but I still wanted to get as far as possilbe before having to turn back to the car at Coastguard Hill. 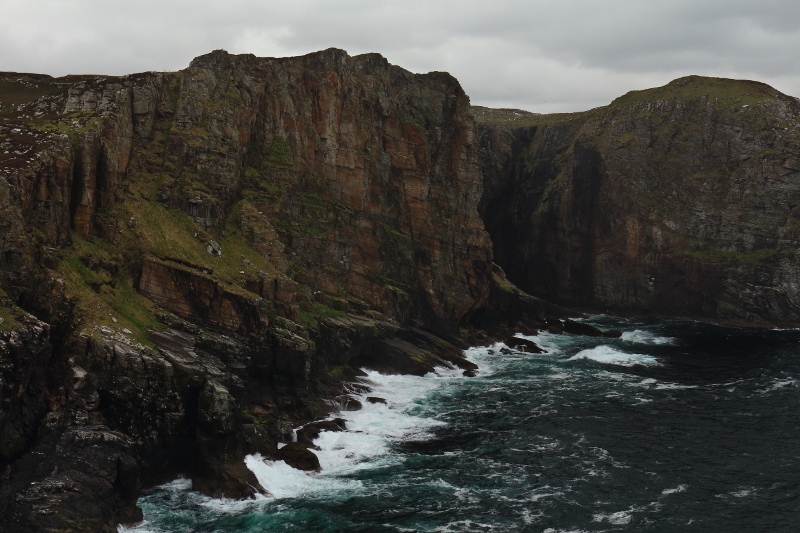 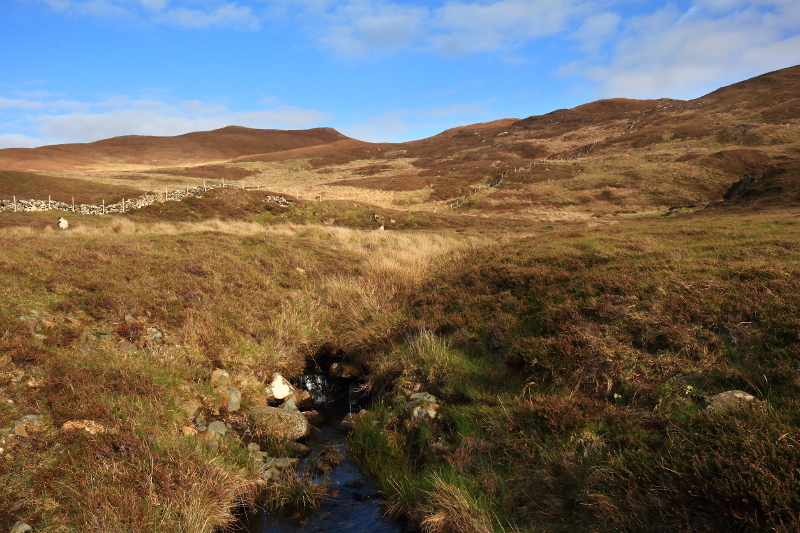 There was a succession of high headlands, divided by deep inlets, and each one enticed me a little further along. 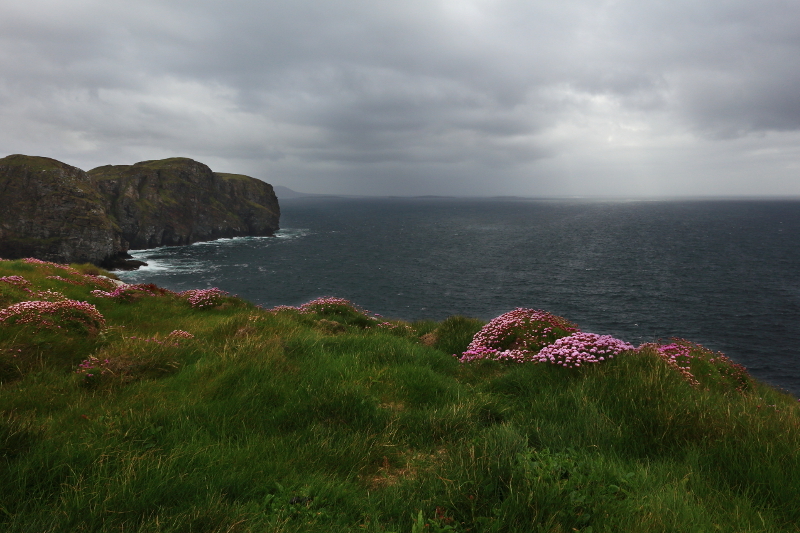 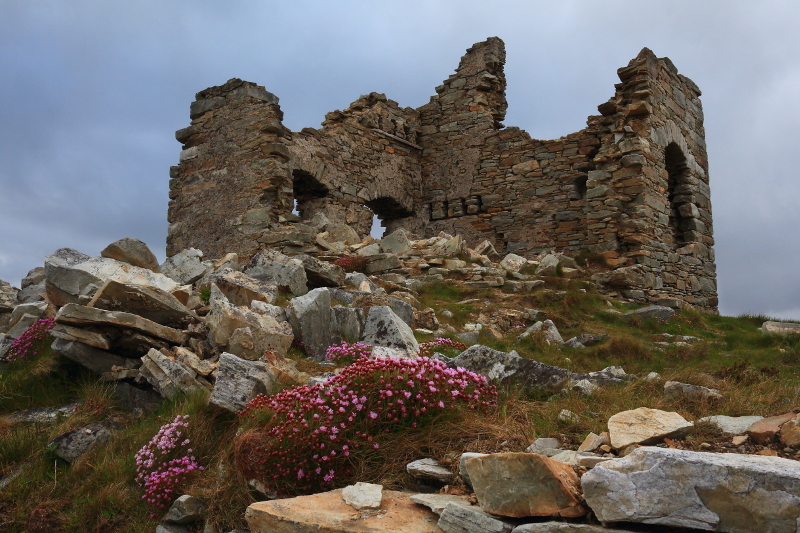 Thrift, also known as sea pink, added a bit of colour on this grassy cliff top. 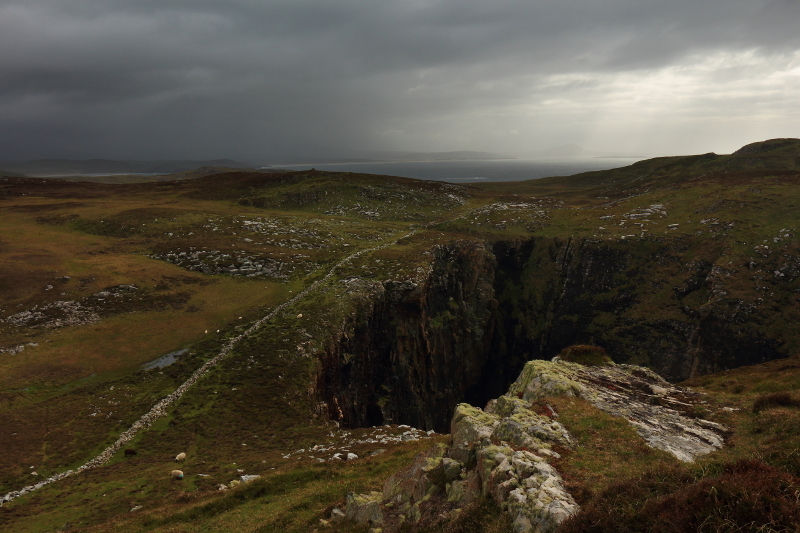 It had been a fairly dark, gloomy day so far, although if anything, that suited this wild, dramatic landscape. 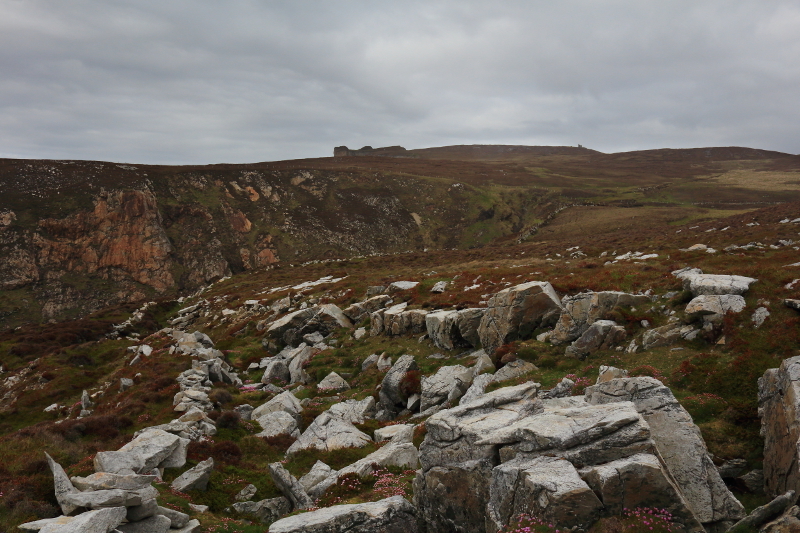 Making may way around one of the deep indentations in the cliffs. 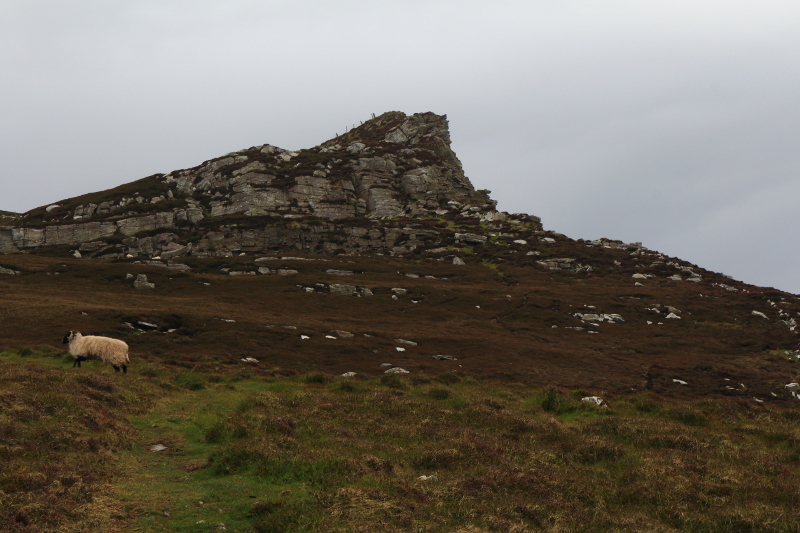 It was getting late, and I had a fairly long walk back again to the car, so I decided that I would turn back once I reached the high point in the above photo. 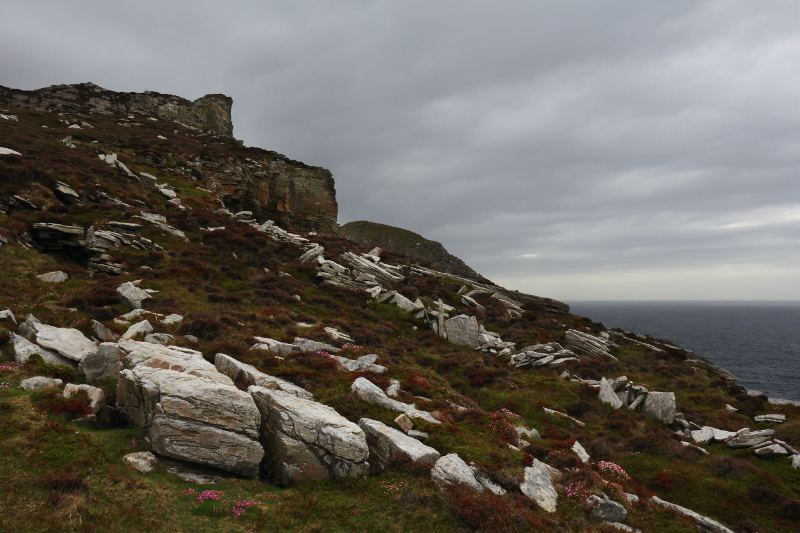 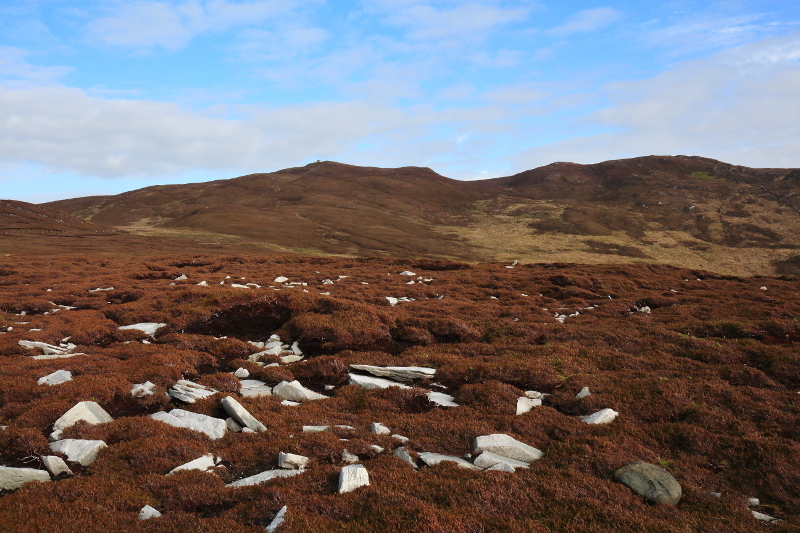 Making my way to the top of the next headland, where I knew I would then turn back for the return leg, I was passing through an area where a lot of the underlying rock was exposed in great slabs, or scattered around in fragmented pieces. 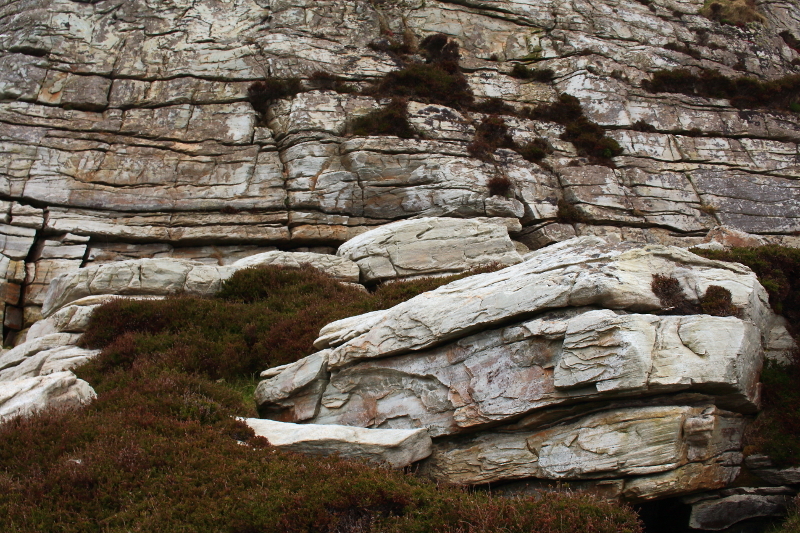 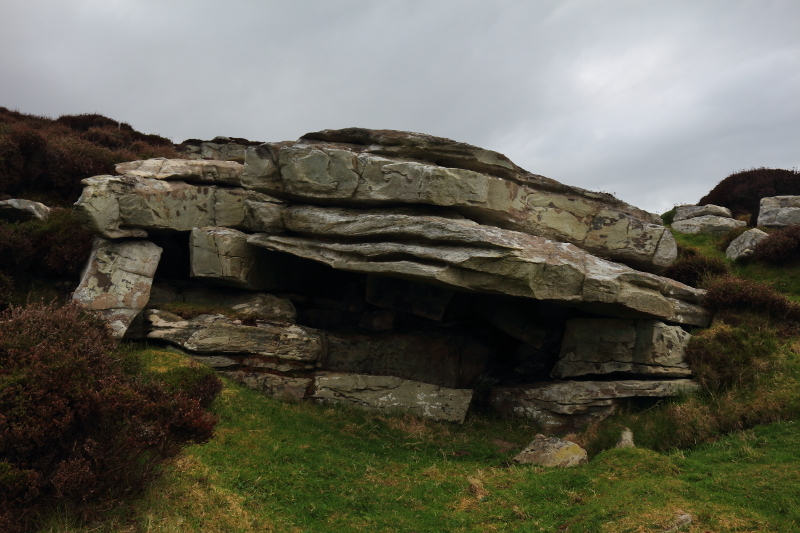 The rock is apparently quartzite, a sandstone which has been metamorphised into quartz, and is the same type of rock as that found on nearby mountains like Errigal and Muckish. 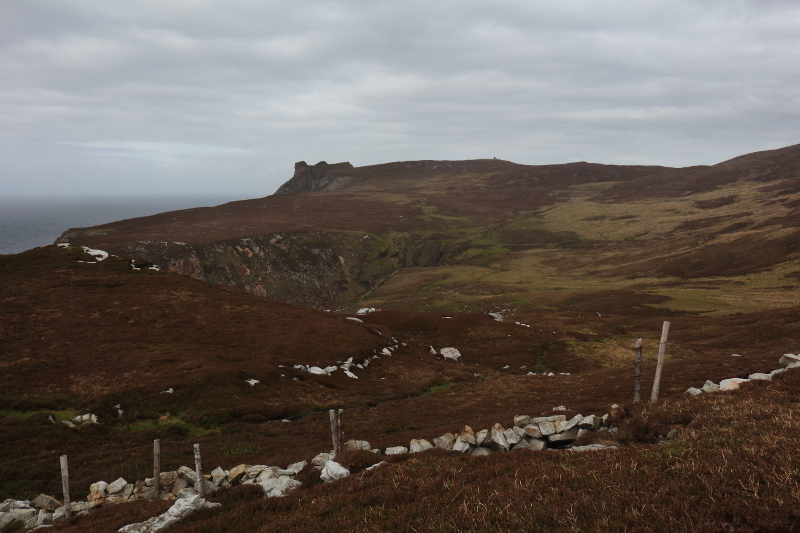 The watch tower, one of the first points I had visited on the walk, was the merest dot on the skyline, to the right of the Horn Head formation. 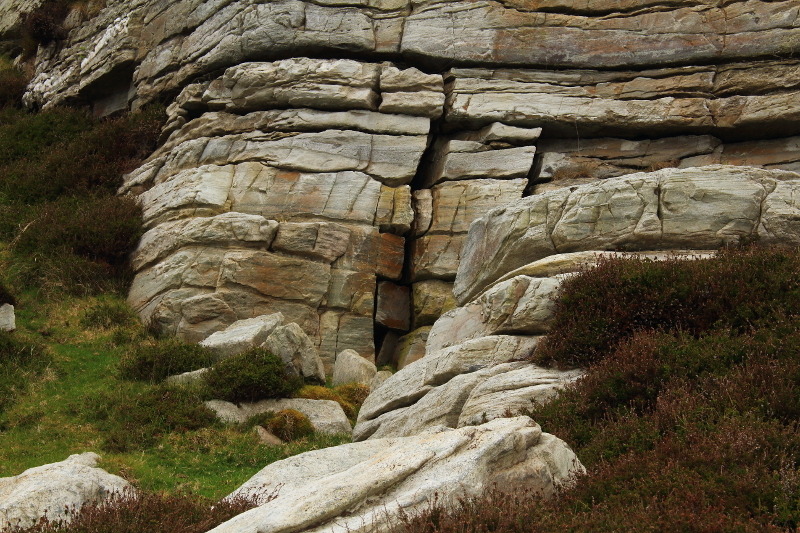 Layered and twisted rock in the cliffs. 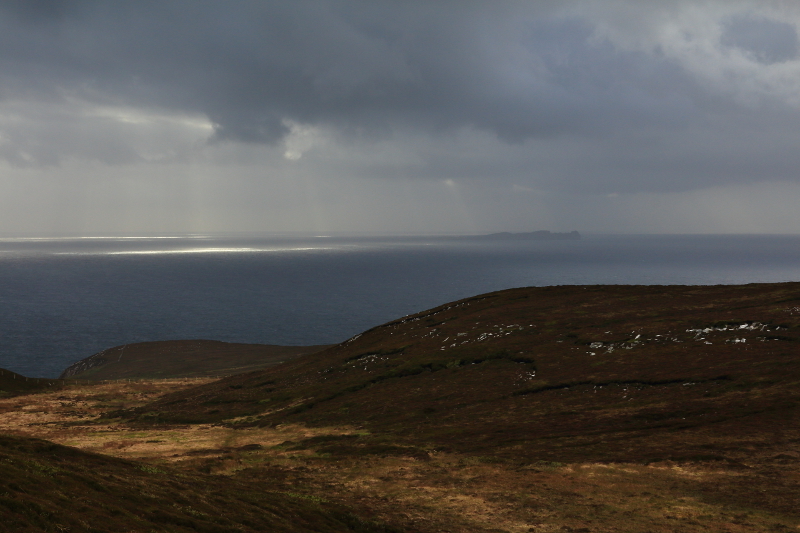 Tory Island on the horizon. 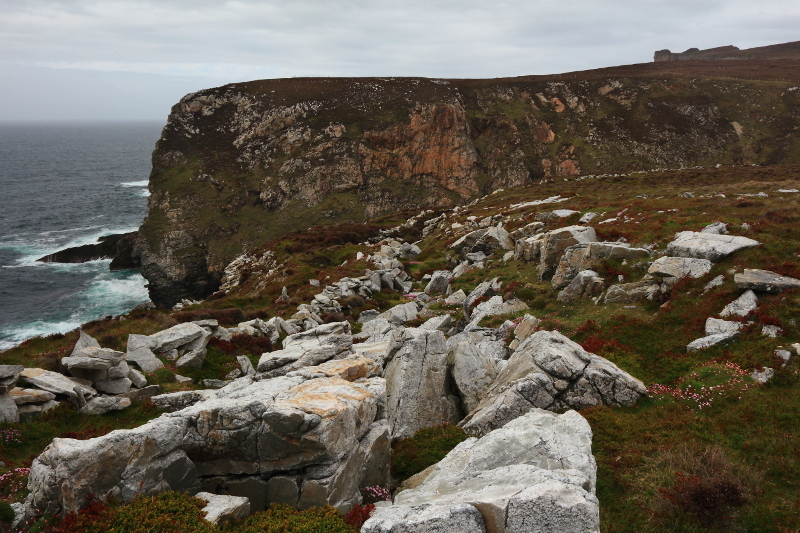 Reaching the top of the next headland, the cliffs still stretched ahead invitingly, but I was running out of time and light for the walk back, and it was time to turn. 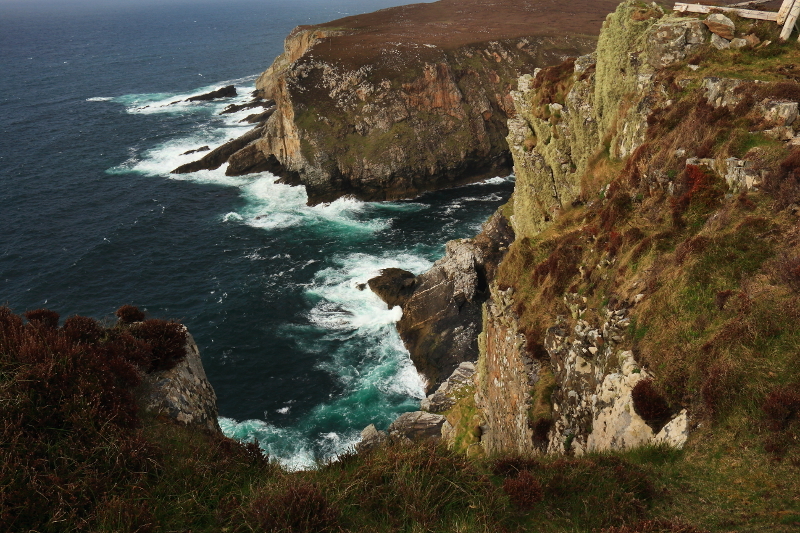 I promised myself however, that I would return to walk the rest of this magnificent stretch of coastline. 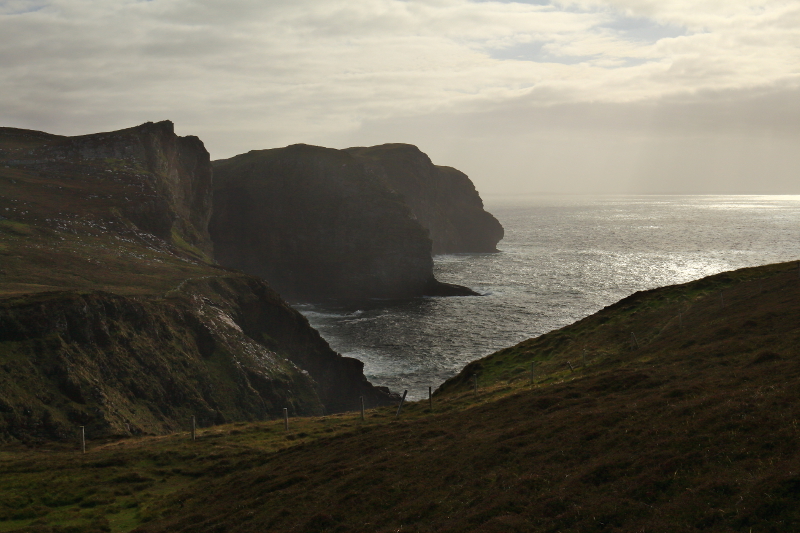 As I started back towards the car, the sun broke through the clouds for the first time that day, briefly lighting up the cliffs with golden light, making for an awesome sight. 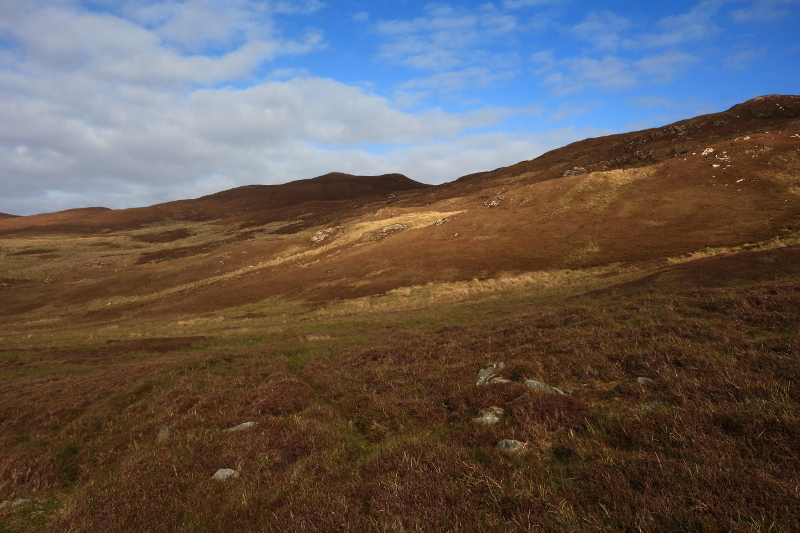 The light also lit up the ridge of higher ground inland, and I made a mental note to include a walk over that raised area on my next visit. 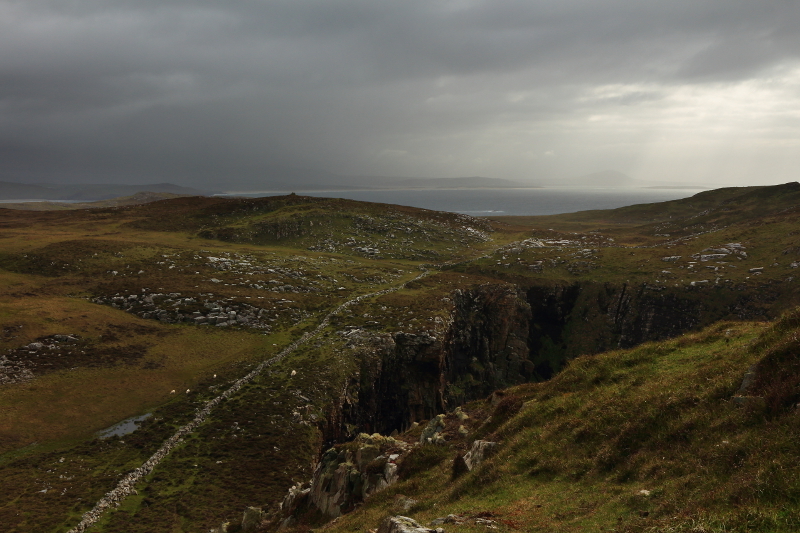 Already, the clouds were beginning to close in again to the west. 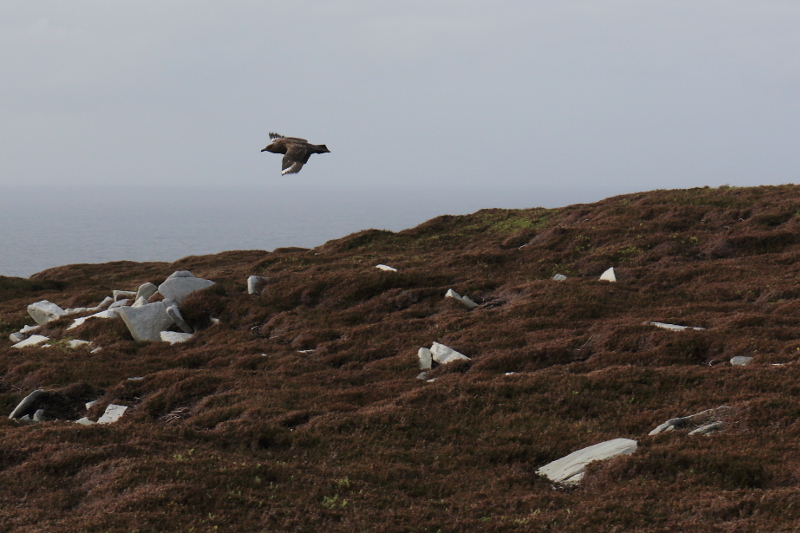 I startled this duck from the heather on the way back. 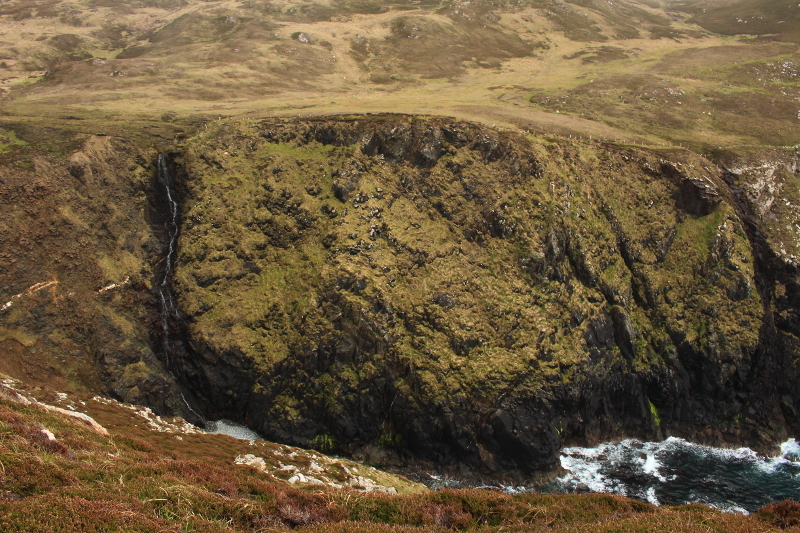 My best guess is that it is a tufted duck or a scaup, but I’m not sure. 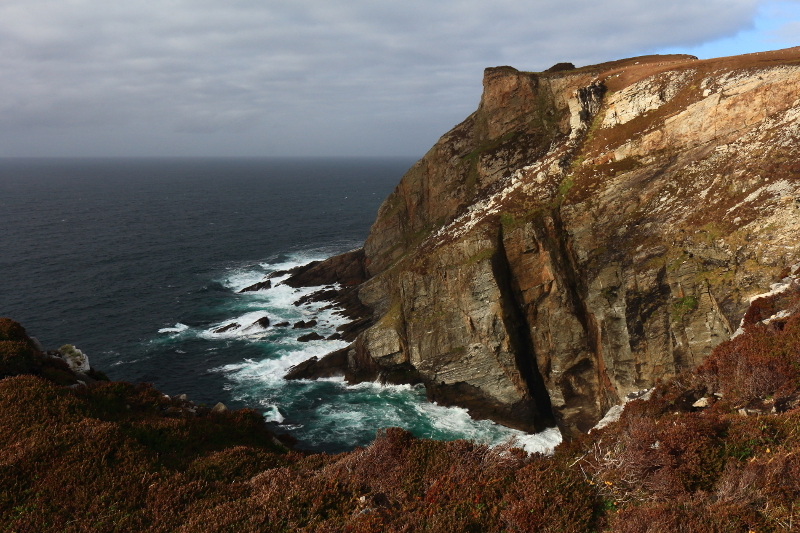 Horn Head catching the last of the sunlight. 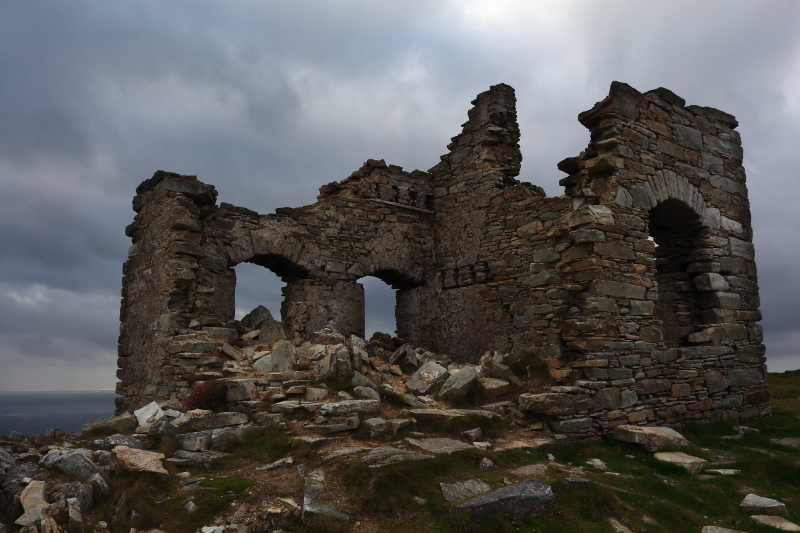 As the sun disappeared behind the clouds again, I arrived back at the ruins of the watch tower dating from the Napoleonic Wars. 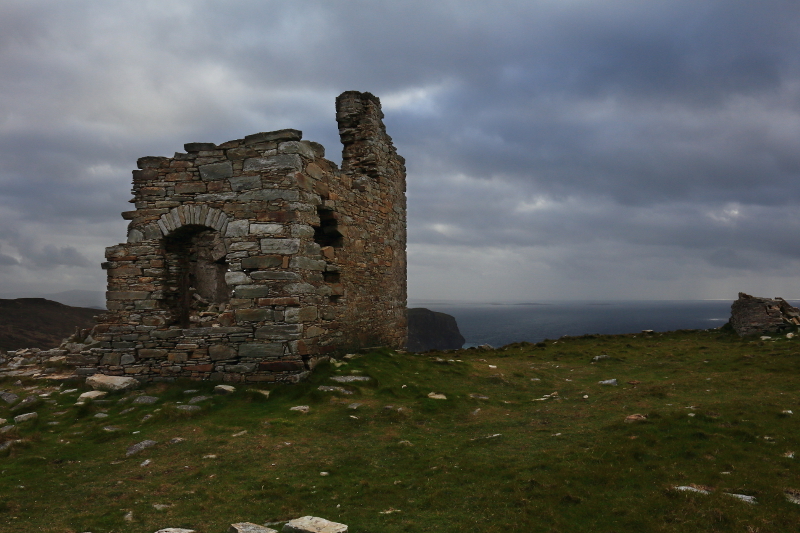 It would soon be dark, but it wasn’t far from here to the car, so I lingered a while, taking shots of the tower against the late evening sky. 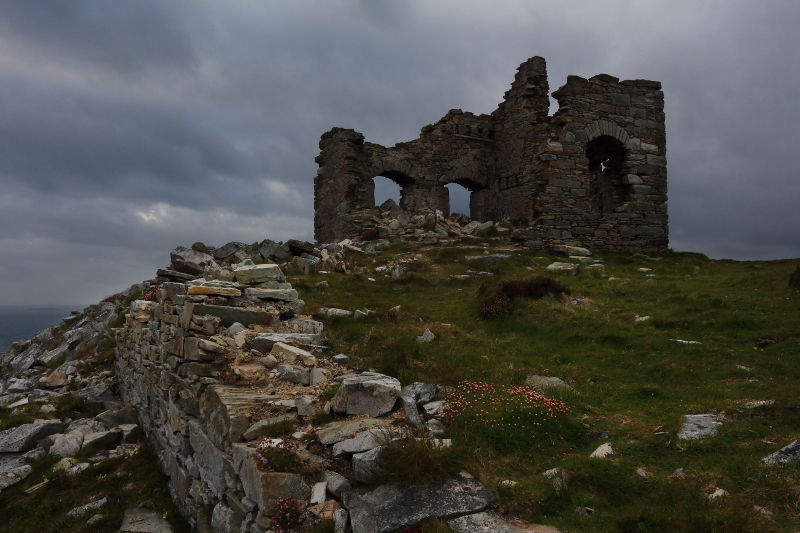 Back at the ruined watch tower. 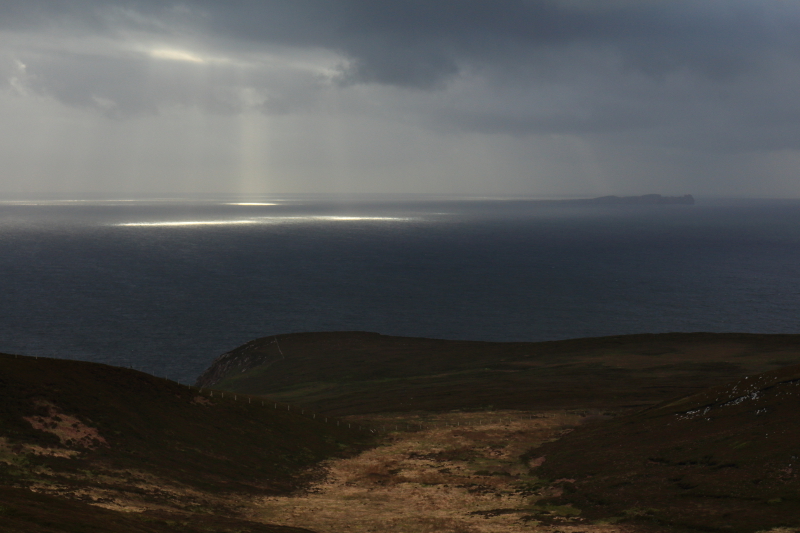 I had a few final glances at the last shafts of light piercing the clouds and creating spotlights on the sea out towards Tory Island, before I felt the first drops of rain, and had to put the camera away. 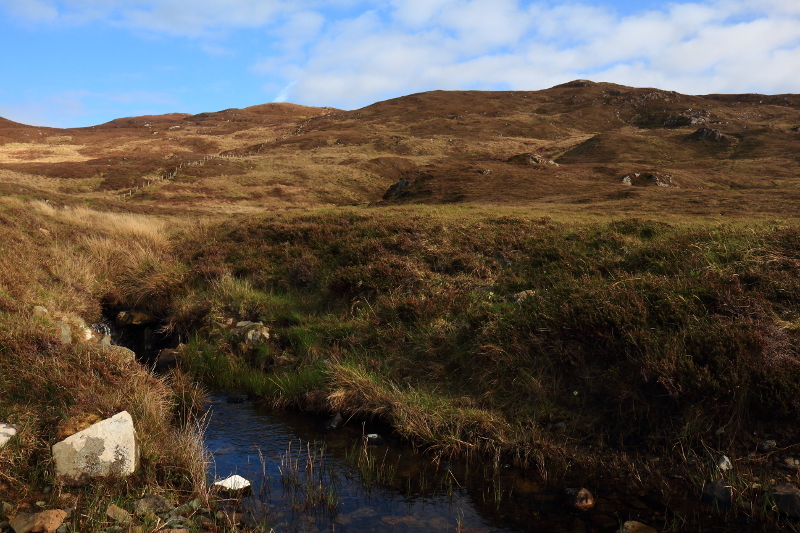 Time to make for the car. 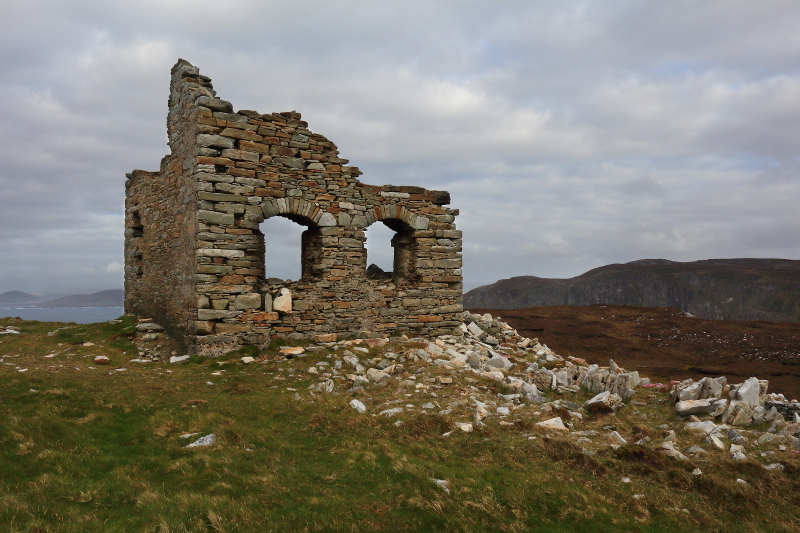 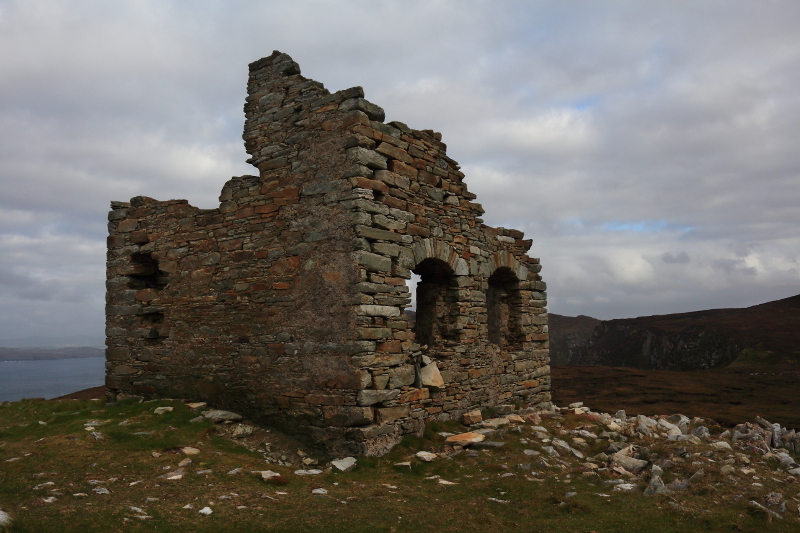 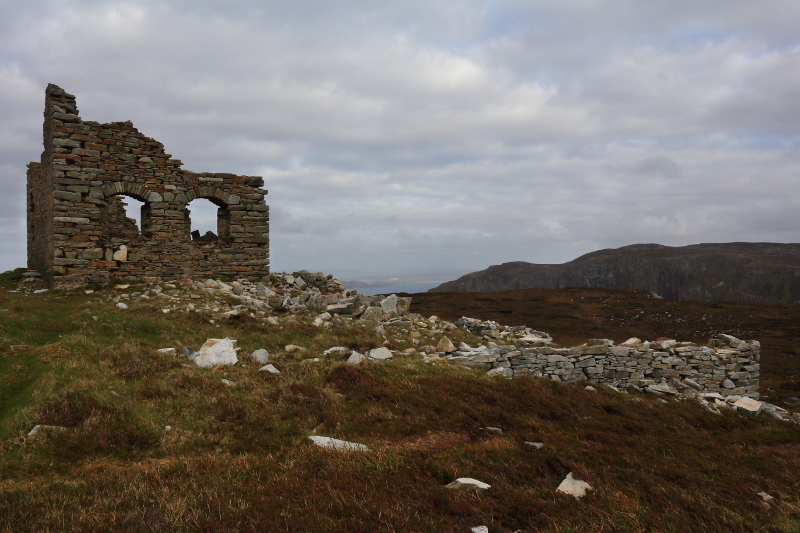 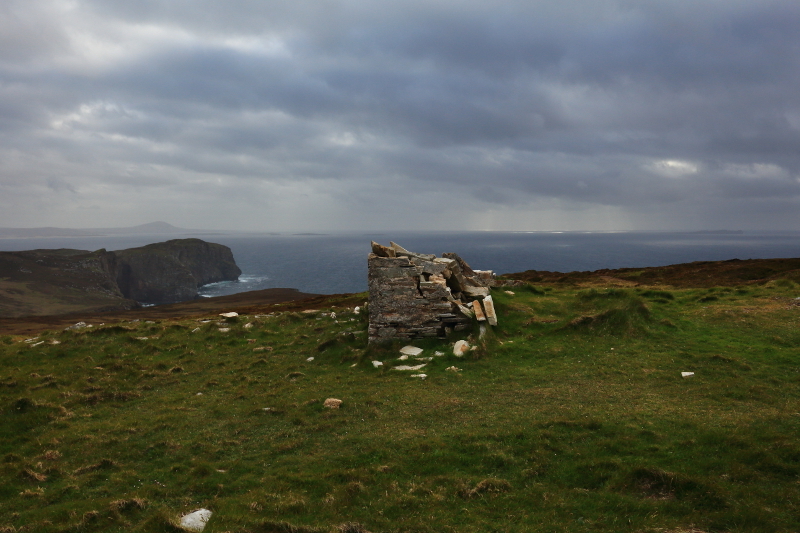 Posted in Landscape, Nature, PhotographyTagged Donegal, Horn Head, Ireland, Napoleonic watch tower, watch tower, Wild Atlantic WayBookmark the permalink.